Mithal, Village Organization member, sharing her story with the participants. Hussain Bux, President of Village Organization, expressing his views on enhancing women participation in communities. Participants at the International Rural Women’s Day event at Dodo Esani Jhakro Village. Women living in rural communities play a critical role in contributing to rural economies of both developed and developing countries. The International Day of Rural Women highlights, both, the contribution that women make in rural areas, and the many challenges that they face. According to FAO’s The State of Food and Agriculture 2010-11, in most parts of the developing world women participate in crop production and livestock care, provide food, water and fuel for their families, and engage in off-farm activities to increase their families’ livelihoods. Needless to say they are also responsible for caring for their children, the elderly and the sick in their families. 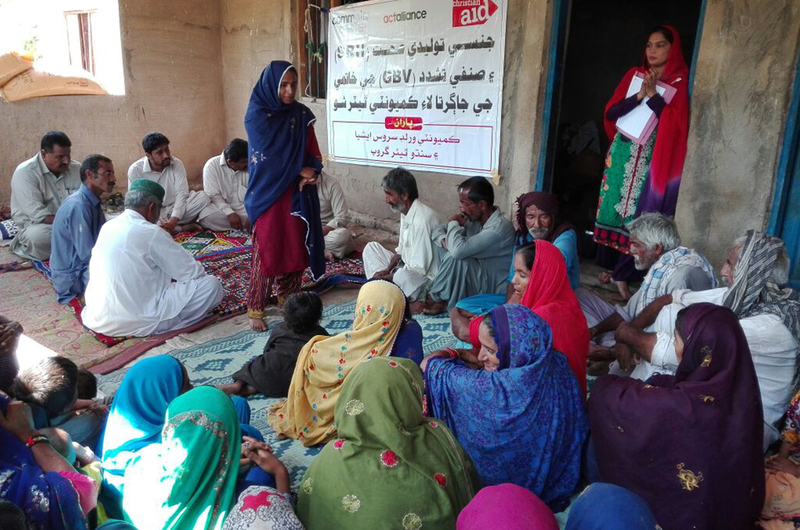 On October 15th 2016, Community World Service Asia celebrated International Rural Women’s Day in collaboration with the Local Support Organizations and the Village Organizations in village Dodo Esani Jhakro, Union Council Bijora, Sindh, Pakistan. 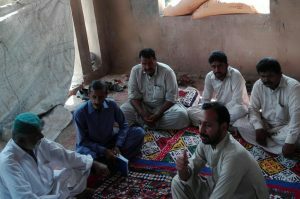 The Local Support Organization and Village Organization invited Muhammad Umar, chairman of the Union Council, as the chief Guest at the celebratory event. A theater performance focusing on sexual reproductive health and gender based violence was the opening show of the event. Through the play, the women of the village conveyed a strong message highlighting the challenges faced by women in rural societies and everyday lives. Razia, wife of Suleman, a member of the Village Organization, shared her success story in a narrative story form on stage, at the event with the participants. She recounted how the women of her village were not aware of the high demand of their handicrafts in the urban market earlier and sold them at cost price. 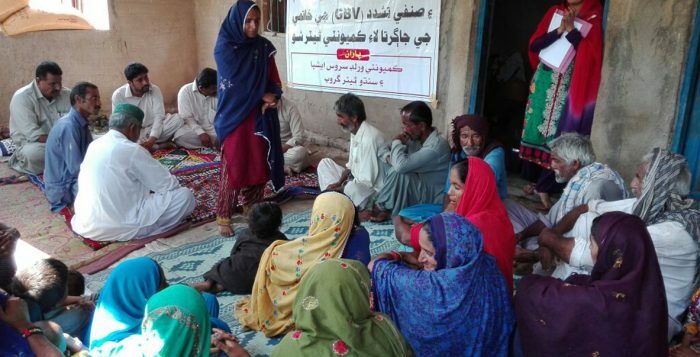 The vocational training center set up in their areas changed the lives of many women in the village, including her own she shared, by enhancing their skills and building linkages with the rural and urban markets. She confidently added that she now has great knowledge of product development and she is earning well through the orders she is receiving for her handcrafted goods. 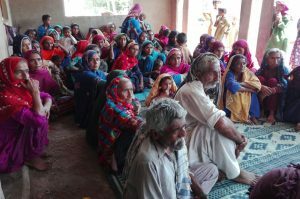 Mithal, another member of the Village Organization, also shared her story about how women in their village were bound and dependent on male family members as the men in their village did not allow the intervention of women in their decisions or matters. 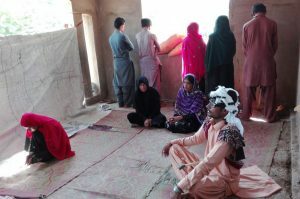 Hussain Bux, president of the Ranta village organization, defined the affirmative role of women and agreed on the fact that the respect of women in societies like theirs has increased due to the awareness building and trainings on gender based violence. This celebratory, yet informative event was attended by a total of 54 people from five villages namely Phul Jhakro, Ranta, Wasayo Mallah, Dodo Esani Jhakro and Nooh Walro. There were many women participants from many villages as well who actively participated at the event.